How to Make a Good First Impression at a Job Interview? Job interviews make everyone nervous but you should ensure that you do not let this nervous affect your thoughts and answers to such an extent that you are unable to give it your best shot. Here are some easy interview techniques you can follow which helps you make a good impression, it will ensure that you are able to bag the job! Once you learn how to make a good first impression at an interview nothing can stand in your way. The following mentioned are few job interview tips on how to make a good impression at a job interview and how to answer job interview questions. Before you can convince others to invest their time and money in your, it is imperative that you believe in yourself and your abilities. It is only when you are confident that you will be able to put forth your thoughts in a coherent and cogent manner. Having a confident air about you will surely create a good impression. When you begin to second guess yourself and start doubting your own abilities you are doing nothing but feeding your own securities and allowing people to make you into an easy target. When you come for an interview with all guns blazing and are able to show the company what asset you are sure to be, do not leave them much options but to hire you! You are able to create a great impression when you put forth convincing reasons why the company should hire you; The ability to speak convincingly is a gift that not many have, so the interviewers are bound to be impressed if you are one of the lucky few to be able to speak in this manner. Do not be mistaken into thinking that a resume is nothing but a summary of all your educational qualifications. A resume can be seen as an important marketing tool where the product which you are advertising is yourself! A seasoned interviewer can tell when a resume has been prepared over a period of time or is simply a product of half an hour being spent at the computer. Take out time to prepare a detailed resume to show that you genuinely take the effort to submit quality work at all costs. Do not believe people when they tell you that you do not have to bother about your physical appearance when going for an interview. Think about it for a moment, would a company really want a disheveled and unkempt individual representing them? No one is saying spend a lot of money on your clothes, but make sure that you look presentable and tidy. If you dress well and look sharp, that will surely help you create a great impression. Choosing a job interview dress is also very vital. Before you appear for an interview a good way to impress the interviewer is by reading up about the company from their website or web page. No matter how well qualified you are, if you show up to interview without proper job interview preparation then you are surely not going to bag the job. So feel free to read up as much as you possibly can and do not forget to include what you have read into the answers that you are giving. When you arrive for an interview the chief skill that they are looking to test is your ability to answer common job interview questions and whether or not you crumble under pressure. No matter what questions are thrown your way make sure to give the best answer which you possibly can. Do not give long drawn answers that are bound to be a drag but at the same time make sure that you do not give rude, brisk one-word replies, unless told to do so. Your good communication skills are sure to instantly impress the interviewer. In addition to speaking about your abilities make sure that you are able to back up each of these with concrete examples. If you say that you have exceptional organizational skills then make sure you tell the interviewer about some big projects you managed that turned out to be great successes, in addition to this do not forget to mention any big companies which you have previously worked for, doing this will surely help you create a positive impression at your professional interview. Nothing will impress the interviewer more than when you show that you are someone who is willing to put forth his or her one hundred percent at all times. Show that you are an eager worker and that you are not afraid of accepting any sort of challenge that is put before you. Do not forget to state that you are an eager learner who is able to pick up new skills and work methodologies with great ease. You will surely be able to impress your interviewer when you are proactive and display befitting body language. When being spoken to, don’t be afraid to make eye contact and in addition to this keep nodding and shaking your head. When you are speaking feel free to move your arms. Just remember that when you walk into the office, walk briskly, when you sit down make sure that you sit straight and look smart. After you have read up about the company and have thought about some ways that things can be improved, then do not hesitate to air your views. You will help you make a good impression when you show that you are someone who is a visionary and is not afraid to dream big as well as take calculated risks. It is only thinkers who are able to take the company to new heights and interviewers know that. Often during interviews, you are asked situation based questions like ‘If you were in this particular situation what would you do?’If you are asked such a question then do not think there is only one right or wrong answer, through your answers they want to gauge how well you are able to think on your feet. So if you have unconventional solutions do not be afraid to put forth your view. If your way is unique and commendable you are sure to create a great impression. Just because you have come for an interview that does not imply that you have to be in agreement with everything being said, adjust so that it does not look like you are challenging the interviewer in any way. There are plenty of ways to air your disagreement without coming across as being rude or too forward. You are sure to create a good impression when you are honest and bold enough to express your own views without inhibition. In the attempt of trying to come across as confident and smart do not forget to listen carefully to anything being said or any advice that is being given to you. You might end up creating a terrible impression at your job interview if you try too hard to be erudite. Being a good listener is indeed a rare quality nowadays so keep your ears open and don’t interrupt the interviewer. Follow this and you are sure to create a good impression. You are sure to impress the interviewer with your honesty if you accept that you do not know the answer to a particular question asked. Many people think that instead of accepting that they do not know something it is better to avoid the question and talk about something entirely different which you do know about, pulling a stunt like this is extremely juvenile and do not try it under any circumstances. 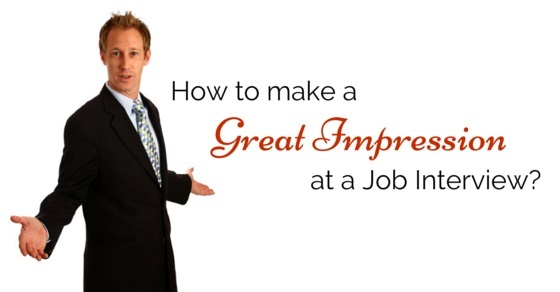 So these are some of the simple ways in which you can make a good impression when you go for any job interview. It is important to make sure that you do not try to be someone you are not. Have faith in your abilities as well as put your best foot forward and you are sure to create a great impression without much effort at all!